The Business Process Outsourcing (BPO) industry hit 1.03 million in total employment in 2014, with 630,000 coming from call centres – a segment of the BPO industry that involves non-primary business activities such as payroll, human resources, accounting and customer relations. A major growth industry in the Philippines, the BPO sector’s export revenues have boomed in the last decade, hitting $13.3 billion in 2014, from $1.3 billion in 2004. The IT and Business Process Association of the Philippines (IBPAP) expects this to reach $25 billion by 2016 with the employment level increasing to 1.3 million. These figures have come at the expense of India. According to the Associated Chambers of Commerce and Industry of India (Assocham), the BPO industry in the Philippines is forecast to grab about $30 billion in terms of foreign exchange earnings from India in the ongoing decade. Assocham also predicted that as much as 70% of incremental call center and voice business will be lost to foreign competition. In a report by the Oxford Business Group, Assocham said that India already lost over 50% of its BPO to foreign competition, which is the equivalent of approximately $25 billion. “The majority of lost businesses relocated to the Philippines where an estimated 30% of graduates are employable, compared to just 10% in India,” Assocham said. Pasig Representative, as well as House Committee Chair on Higher and Technical Education, Roman Romulo, mentioned that an estimated 372,000 seats in major call centres will be given to Filipino college graduates in the next three years. With an affection for American culture and a flair for American-accented English, Filipinos turn out to have a better understanding of American idioms and references, and are more adept at engaging English speaking customers. In a report by GlobalEnglish Corporation, the Philippines was named the world’s best country in business English proficiency while India was ranked ninth. The Philippines also has a higher literacy rate at 95% to India’s 63%. Other factors that make the Philippines the destination of choice include better telecommunications infrastructure and strong government support for the BPO industry. Government initiatives include the Training for Work Scholarship Program, which enables the IT industry to provide training for BPO applicants. On top of that, investors are given a number of benefits, such as tax holidays, exemptions on imported capital equipment, simplified export and import procedures, and freedom to employ foreign nationals. 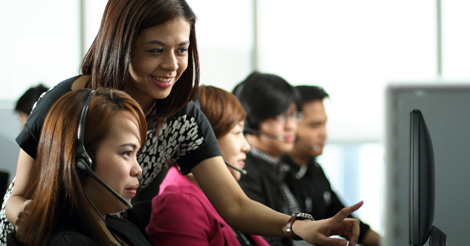 Most of the world’s major BPO service providers have a presence in the Philippines. In 2014, Manila moved up the ranks, knocking off Mumbai from its perch as the second most important BPO destination worldwide out of 100 top BPO destinations published by Tholons, a leading full-service Strategic Advisory firm for Global Outsourcing and Investments. While Bangalore remains in the top spot, Philippine cities are on the rise with Cebu City taking the eighth place, with five other cities making the final cut.